A lot of people who dream of working in France mistakenly assume they can apply for jobs using their existing resume, whether it be an American resume, British CV, or some other country’s. 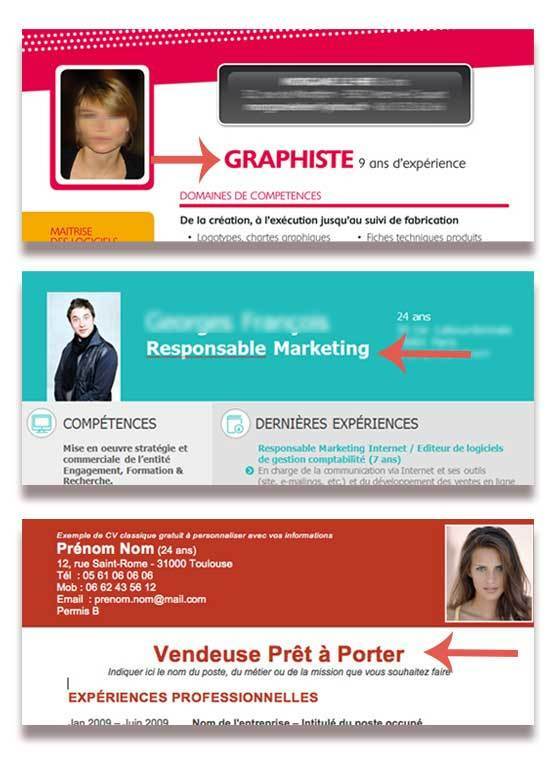 Unfortunately, most countries, including France, have different expectations as to what a proper resume / CV looks like. Ignoring these differences could land your resume in the trash. Fortunately for you, it’s not that hard to make a CV that conforms to French hiring managers expectations once you know how. DON’T CALL IT A RESUME IN FRANCE: Throughout this article, I use the term “French resume” and “CV” interchangeably but the correct term used in France is just “CV”. -pronounced [SEY-VEY]. It’s short for curriculum vitae, a Latin word that means “the course of my life”. Before I created my resume for the French job market, I did what most people do. I researched the hell out of the subject. 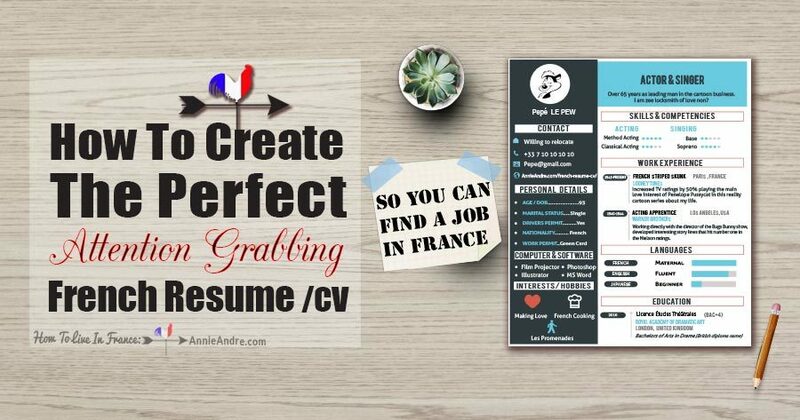 I read countless articles written by French experts, recruiters and hiring managers, visited dozens of French employment forums, analyzed way too many resume’s created by French people and even asked my friends living in France how they created their CV. The bad news is, there is no magic formula, no holy grail CV recipe that if used will land you any job you set your sights on all of the time. The good news is, even though there are differing opinions from the so-called experts of what constitutes a great CV, I learned that there are standard rules, guidelines and best practices you can use that will satisfy the expectations of most employers and industries in France. You just need to know when and how to use them to your advantage. By the end of this article, you’ll have a better understanding of CV best practices in France and you”ll be able to create your own CV so you can start applying for jobs in France. How many pages should your CV be? Do you need to include a photo on your CV? What address should you use on your CV if don’t live in France? Do I really need to include a hobbies section on my CV? 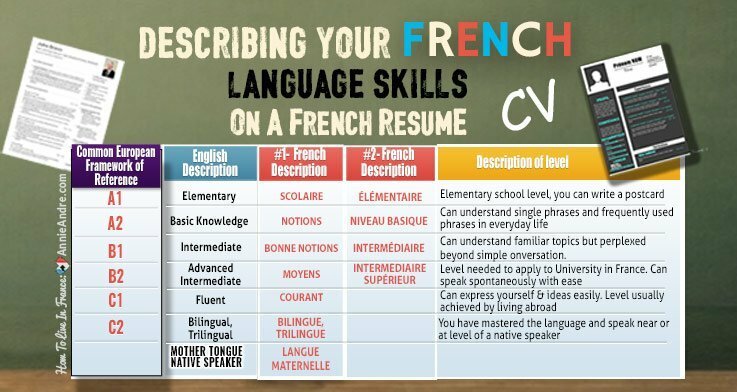 Do you need to translate your CV to French? When to include them and how to include them correctly . The first thing you should be aware of is that there are about 20 different things you need to consider including on your resume. Each of the 20 things can be rolled up into one of the 9 possible sections listed below depending on how you format your CV. 3rd section: Contact Information – (How to properly include your address and phone number). 4th section: Your Work Experience – (Keep it short and sweet). 6th section: Skills & competenciess (A useful and powerful thing). Not all of the 20 things listed in this article are obligatory however they may still be expected. While other things are expected but for various reasons, you may not want to include them. You’ll need to know when to include them and how to include them so that you present yourself in the best possible way to French hiring managers. You have 7 seconds to convince a hiring manager to read your CV. A great headline which consists of a headline title and headline summary not only improves readability, it immediately grabs the hiring manager’s attention and entices them to read the rest of your CV. If you’re like most, you probably skim and glance through headlines. If one grabs your attention you maybe read the first paragraph. If that first paragraph peaks your interest, you keep reading. If it doesn’t, au-revoir. When it comes to your CV, recruiters and hiring managers think and act much the same way. Studies prove that the average employer, who may have to quickly wade through hundreds of CV’s, will spend as few as 7 to 10 seconds scanning your resume before they decide if they want to keep reading or not. That’s why you need to include a great headline which consists of 2 things, an attention grabbing CV title and an enticing CV summary at the top of your CV where recruiters look first. Together the Title and Summary tell the hiring manager who you are in terms of the position you are applying for and what you can do for the company. Let’s explore how to incorporate these two things in your CV. A CV title or headline title as some people like to call it is NOT your name nor is it the words “curriculum vitae”. It’s simply a job title- either the title of the job you are targeting or a more general job title like “sales & marketing professional”. It may seem silly to put a job title at the head of your CV but it has several advantages. When a busy manager or recruiter sees the job title, he doesn’t have to guess which job you are interested in. He or she can mentally assign you to a potential vacancy quickly. And if for whatever reason your resume gets circulated around the company, no explanation is necessary because it states right at the top of your CV, clear as day the job you are interested in. For Example: If you apply for a job advertised as “IT specialist”, the title at the top of your CV could read “IT specialist”. If the type of work you do spans different but related fields or you plan on posting your CV to a job board, you can use a less specific / more general job title like “Human Resource Manager & Generalist”, “Sales and Marketing professional” or “Web Marketing professional”. Below is a screenshot of a few CV’s that use a title to announce the job they are targeting. Notice how it grabs your attention. You know immediately who this person is in terms of their experience. You might be interested in this: Why and how to write an attention grabbing CV title here. Remember you only have a few seconds to make it abundantly clear “what you can do for the company and what your value is”. By including a CV summary – a short, snappy introduction that highlights and summarizes your experience and best skills as they relate to the potential job, employer or industry, you are essentially telling them what they want to know. Now that you’ve got their attention with a CV title, you need to entice them to keep reading. At this point the recruiter has no idea if you are qualified for the job or what skills and experiences you have so most recruiters will begin skimming your CV for keywords and past job titles before they decide to put your CV in the maybe pile or the “no thank you pile”. You can help the recruiter see your true potential in under 10 seconds by including a resume summary directly under the CV title. Not to be confused with the outdated ” objective statement” which is about “what YOU want from the company”, a resume summary is about “what you can do for them”. The key to a well written summary is to sell yourself and impress them in as few words as possible- 2 phrases or less. It should shout “Hey, I’m the person you’re looking for”. If they like what they read, then like the newspaper example above, they will keep reading your CV which is exactly what you want. One last thing. Hiring managers are busy people. The last thing they want is to be bogged down trying to decipher your fancy business jargon so make sure your summary is short, easy to read and focused on the particular needs of employers in your industry or targeted job. Obviously make sure the skills and experience you include on your CV support y our CV summary. Here are a few ideas of what you can include in your resume summary. The number of years of experience you have in the field. Special skills you that make you uniquely qualified. Any certifications or education you’ve obtained. Some sort of display of your passion for this line of work. The specific industry or topic of your expertise. The keywords an employer might search for when trying to locate a candidate for a particular job. Resource: If you need help crafting a memorable headline, you can read these articles at TheBalance.com and Monster.com . Here is another article that offers tips on how to write a great CV headline. Examples of CV’s with a title and summary. More than 8 years experience in media planning, buying and strategies. Curious and passionate about web-marketing, and always up to date with the latest digital innovations. The above example was taken from the French CV in the screenshot below. Some French experts say certain personal details, which could be used to discriminate against you should never be included while others say they should. Still others say you should only include them if they will improve your chances of getting an interview. You’ll have to decide which personal details you are willing to divulge based on your unique set of circumstances but keep in mind that if you don’t include certain personal details on your CV, you may still be asked in an interview. Below is an explanation of how and when to include your personal details on a CV in France. Should you include a photo on your CV? It’s a question that gets asked a lot even by people in France and the answer is it depends. 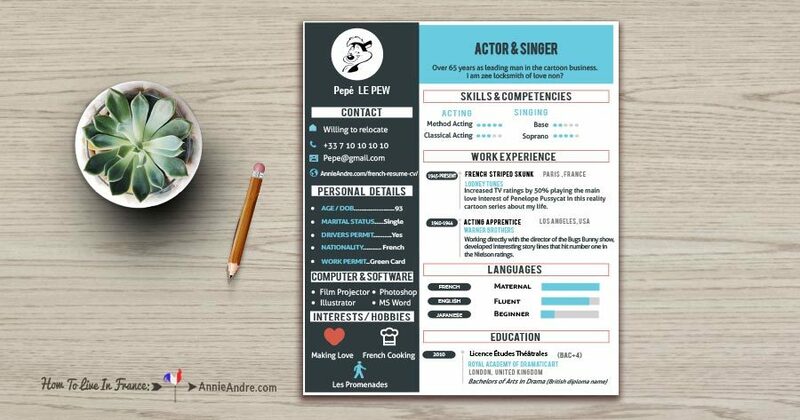 It’s still common practice to include a professional looking photo on a CV in France and most if not all recruiters actually prefer that you do but it’s not always necessary. So when should you include a photo on your CV? Well if you’re photogenic, have a flattering, professional looking photo of yourself and feel confident that including your photo could improve your chances of getting called in for an interview than yes, I think you should include one. If for whatever reason, you don’t want to include a photo, it may be fine for some situations to exclude it but this is where things get a little tricky. For instance, employers hiring for customer facing positions such as sales reps or sales clerks will probably want to see a photo of you to make sure you are “well-groomed or presentable” in their eyes. Whereas, if you are applying for an accountant position or some other position where you won’t see customers or clients, less weight may be put on the fact that you didn’t include a photo. But it depends on the person looking at your CV. A friend of mine told me he knew a Blond hair, blue-eyed guy whose name sounded phonetically too close to a terrorists name so a recruiter suggested that he include a photo of himself so no one would discriminate against him based purely on his name. If you look too old or look too young for the position you are applying for or if the employer doesn’t like a certain race they could discriminate against you. It’s hard to know but it can and does happen in France. Ultimately you have to think strategically and perhaps create a version of your CV with and without a photo and test to see which one gets more call backs. Don’t use an extra-large font for your name. You don’t want to draw attention away from the headline of your CV. In France it’s common to write your last name before your first name in formal situations, on forms, legal documents and some people even do so on their CV. If you have a name which makes it hard to differentiate between your first and last name like Martin, Simon and Andre or have a foreign name which might be difficult for French people to decipher, write your family name in ALL CAPS, and first name in lower letters. Example: I could write my name as Annie ANDRÉ or ANDRÉ Annie and a French hiring manager would look at either combination and understand André is my family name because it is in all caps. If you think you might be discriminated against because you are too old or too young for the job you are applying for, consider omitting your age. However, some recruiters say it’s futile to exclude your age because if an employer really wants to know how old you are, and they usually do, they’ll try to deduce your age based on the year you graduated or by looking through your work experience section. Why not test out the waters and create one CV with your age and one without and see if one fares better than the other. It used to be second nature to include your marital status on your CV in France but these days it’s more or less rare. Those that do include their marital status tend to be younger, under 25 and single which can work to your advantage in certain situations. You may be discriminated against if you include the number of children you have on your CV. There was once a time in France when people regularly included on their CV the ages and number of children they had but today it’s almost never included. Probably because employers discriminated against women fearing they would miss work due to a sick child. For some it may be necessary to prove you have reliable transportation to get to work. In France, it’s not uncommon for people under 25 to indicate whether or not they have a drivers permit called a “permis B”. Some people even go so far as to indicate they own a car ” voiture personnelle “. If you live in a more rural area of France where a car is necessary to get to work it may be a good idea to indicate this however If you are applying for a job in Paris and live in Paris, you have access to the metro and won’t need to indicate if you have a permit to drive or not. Obviously, if you don’t yet live in France, you won’t have a French drivers permit. Either way, you won’t be penalized if you leave this off your CV so just omit it. The general consensus is, if you’re not French, you should include your nationality. It can be to your advantage to include your nationality, especially in cases when your native language skills are essential job requirements. If you have dual nationality, include them also. if you are authorized to work in France, simply state “Authorized to work in France (“autorisé à travailler en France) next to or under your nationality. If you’re not authorized to work in France, you won’t get as many responses from employers because of all the red tape a company has to go through to hire non EU and non French citizens who don’t already have the right to work in France. They not only have to sponsor your work visa but they usually have to attest that no French person is available for the job. Your chances of getting sponsored to work for a company increase depending on the industry. It’s very important that you include all your contact information correctly but if you don’t live in France, you’ll have some challenges in terms of how you list your address and phone number on your CV. You may also need to include links to some of your social media accounts or websites if they are pertinent to the job you are applying to. -Website links such as to your portfolio, blog or online resume. Always include your full address no abbreviations. 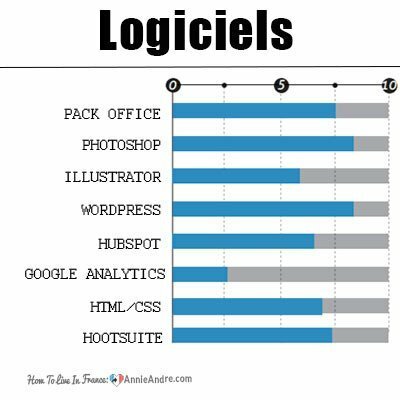 If you live outside of France, here is what you should put in he address field on your CV. Employers like it when a potential candidate lives nearby for obvious reasons but if you don’t live in France you should let the hiring manager know that you don’t live locally but are willing to relocate. Here are a couple of examples of what you could put in lieu of your actual address. Make sure to use your cover letter, which is called “une lettre de motivation” to explain in more detail your situation. You can of course always include your foreign address and if you do make sure you use your full address (no abbreviations). If you live outside of France, be sure to prefix your phone number with your country code. Include the best pone number where a recruiter can contact you. I suggest a cell phone number rather than a landline. If you’re located outside of France, make sure you include your country code with a (+) followed by your phone number. Always include a professional email address. In this day and age, it’s pretty much a give-in that you need to include an email address on your CV. Just make sure to use a professional looking one. hot-mother@gmail.com and eat-my-dust@gmail.com are NOT PROFESSIONAL looking. Only include links to your website, portfolio or blog if it’s pertinent to the job you are targeting. If you have an online version of your resume, you can list that address. Think twice before including your social media links, it could hurt your chances. Unless you are a new graduate, your professional experience is going to be the meat and potatoes of your CV and you will list this section towards the top of your CV before your education. Be careful to list the most recent jobs and exclude the ones that are too old, or don’t demonstrate your ability to do the job you are applying to, especially if you think it will help keep your resume to 1 page. If you don’t have enough professional experience, add your internships, volunteer work, student organizations, military service or awards. Below are things for you to consider when writing this section of your CV. When describing your duties for each of your previous companies, don’t list every single duty and skill you learned at each job. The hiring manager is only interested in the duties that demonstrate you are well suited to do the job you are applying for. Write a phrase or two describing your job role and keep sentence structure short and concise. Use industry standard keywords when you can, the hiring managers will be looking for those and if your CV lands in a searchable database, it will help your CV pop up on more searches. In some cases you may be able to exclude your job description all together. If you held the same position or performed the same duties from job to job, why bother writing out the same thing under each job? Instead use the “skills & competencies” section to highlight your, and group your competencies and domain skills. Doing so no only makes i easier for hiring managers to digest your CV in one sitting, it also helps keep your CV to one page which hiring managers love. In some cases you may need to write a more elaborate job description. On the other hand, if your experience matches the position you are applying for and you want to call attention to it, you can opt to write out your tasks, achievements or responsibilities in more detail. Don’t forget to include other pertinent information such as industry, company name, city, country and dates. Industry or Short description of the company: If the company where you worked is not well-known, you can describe what it does or simply state the industry of the company. Company Names: You can make the company name a hotlink so hiring managers who view a digital version of your CV can quickly jump to the company website. Your job Title: Use industry standard job titles instead of creative titles made up by companies like database Analyst instead of Database Monkey. This is important if your resume is put into a database. Searches will be made using standard job titles not made up ones. Dates of your employment: You can simply list the month and year for both start and end date like this – (Juin 2012- Juin 2017). City and country: If you have held jobs in other countries, i.e. not in France, you should include the city and country and don’t use abbreviations. France does not use the same date format as the US. If you want to put the complete date for anything make sure you use this format- DD/MM/YEAR. 5th SECTION: What’s your education and training worth in France? Do you know what a BAC, BTS or a License is? Probably not because the education system in France is very different from the Anglo-Saxon systems. 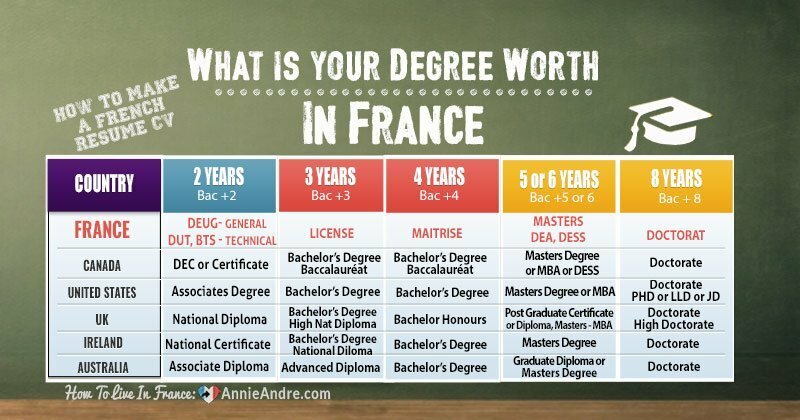 French recruiters may be equally clueless about the degree, diploma or training you received in your home country. In order to make your level of education clear to French employers, you need to find the closest French equivalent degree or training to yours and list that on your CV along with the original name of your degree. It can be confusing to find the equivalent French degree, so I created a chart comparing a few degrees from several English-speaking countries. Use it as a guide not as gospel. In other words do your own research because there is a lot of gray area. License en Economie- “Un License’’ which takes 3 years to earn in France is the equivalent to a bachelor’s degree earned in 4 years from Canada or the US. Unlike North American University students, French students spend all 3 years focused on their major while in North America, students usually spend the first 2 doing general studies followed by 2 years of major study. BAC: is short for Baccalauréat, the name of a French high school diploma. : There are so many different programs after secondary school in France, it is helpful to call out the number of years of higher education you hold. A “BAC +4” tells the hiring manager that I have 4 years of higher education (after high school). Bachelors Degree in Economics- I included the name of my degree in English. If you received your degree in Spain, use the Spanish name, etc. Although not required, most recruiters agree that including a skills section on your CV can be powerful because it can help employers QUICKLY ascertain your domain skills and competencies which can give you a leg up over other applicants. This isn’t a dumping ground for every skill you’ve ever learned at every job. Employers only want to see those core skills and competencies as they relate to the job you are applying for. If you have a lot of different skills, I suggest organizing them into domain groups or categories which will make it easier for employers to skim your skills. For example “Sales”, “Marketing,” “Writing,”. Under each domain heading, you would then list the skills associated with it. Your applying for a job in France and you’re not French. Of course you should state your French language level. The language section is usually towards the bottom of the CV however if language skills are an important requirements of the job, consider calling attention to it by mentioning it in your title or resume summary at the top of your CV or pushing the language skills section up higher on your resume. Be sure to also indicate your native language and any other languages you speak along with the level at which you speak. When you describe the level at which you speak -try to be as specific as possible and never EXAGGERATE your language skills because it’s just too easy to verify. You can use the CEFR system or self evaluate your language skills. If you have taken a French test like the DELF, DILF, DALF, TCF or the TEF, than you know that student language level results are divided into six levels: A1, A2, B1, B2, C1, C2. This system is called CEFR (Common European Framework of Reference). Using the standardized CEFR system will make it immediately understood at what level you speak. Don’t forget to include your mother tongue and state that it is your native language. If you have not taken an official French language assessment test, you can self evaluate your French language level by guessing or take one of the many Free online French tests which will give you a ball park of your language proficiency. Bonjour de France is a good place to test your French language skills but other ones exist too. Like this one I found at French Exams. A1 = Elementary– (Scolaire), (Élémentaire): You’re a step up from beginner. You can form simple phrases and write a post-card. A2 = Basic knowledge – (Notions), (Niveau basique): With a little effort, you can understand single phrases and frequently used phrases in everyday life. B1 = Intermediate – (Bonne notions) or (Bonnes connaissances) : You can speak and understand familiar topics easily but may get perplexed beyond simple ones. Level needed to attain if you were to go to a French university. C1 = Fluent – (Courant )- You can express yourself and your ideas easily. C2 = Bilingual, trilingual- ( Bilingue), (Trilingue): You have mastered the language, you’re bilingual and can speak near or at the skill level of a native speaker. Mother tongue or Native language – (Langue maternelle) or (natif): Use this to refer to your native language(s). Here is an example of how you can describe your language level on your CV. In this day and age, it can be important to show you have certain software and computer skills. No need to list everything, just the skills that are important for the job you are applying for. And don’t forget to mention the Microsoft office suite or any other program known by the company or the industry like SAP or Oracle for example. In addition to listing the software and computer skills that relate to the job you are applying for, you can also demonstrate your level of expertise either through written words or visually. Using visuals looks great but is not appropriate for all industries. For example a graphic artist might be able to get away with visually showing his or her skill using pretty graphics but an accountant might not. Another thing to note is that some companies might have an internal database that scans resumes for keywords. Showing your skill level visually will not be scannable so make sure you also have an all text version of your CV on hand. It may seem irrelevant and unprofessional to include your hobbies and interests on your CV, especially if you are from North America but in France it’s not seen as something silly. Most job seekers in France actually do include this section on their CV and you should to if you can. Although French employers won’t care if you exclude this section, including your extracurricular activities might be the thing which will catch employers’ attention, help you stand out from other candidates and land you an interview. First of all, the hobbies and interests section is not a catch-all category where you dump any and all of your hobbies like yachting and pressing flowers. What use would that information be to a hiring manager? Think strategically-do a little research and emphasize those hobbies and interests outside of work that have enabled you to develop useful skills in life that also align with the job you are targeting, a specific industry or particular company’s work culture. What your hobbies and interests might say about you. Not all will apply. Certain hobbies and interests will demonstrate different qualities and strengths which might match the qualities needed to perform a certain job or work in a certain industry. For example, if an advertised job states that they are looking for someone who is “an outgoing team player”, you would not list stamp collecting as your hobby which is more of an individualistic and introverted hobby but instead you might list any team sports you participate in. There are too many examples of hobbies that you could include on your CV but here is a short list of what certain hobbies and interests might say about you. show you are a team player: Team Sports (Basketball) – You excel at teamwork and have leadership skills. Try to list a range of hobbies and interests. You should also try to provide a range of activities that show you have a variety of traits. If you do, you’ll show that you are flexible enough to be comfortable in different situations and you’ll be more relatable to a range of different people. Don’t mention these hobbies and interests. Don’t mention any religious affiliations or political affiliations unless they will help you get the job. Don’t mention expensive hobbies like yachting. Don’t mention any controversial associations like being a member of a pro-abortion or pro-gun group. You now know all the parts of a CV for the French job market however there are a few things you need to know before you start writing it. How many pages should your French CV be? It’s a question that gets asked all the time and something you should keep in mind as you create your CV. The general consensus is a French CV should usually be 1 page and never ever be more than 2 pages. Not even if you’re the CEO of a company with 40 years experience. 1 PAGE If you’re a recent grade, have little to no work experience or are an entry-level candidate: your resume should be one page. 2 PAGES: Even if you have years of experience you should shoot for 1 page but if you must, don’t exceed 2 pages. Remember when I said the 20 things which you can include on your CV could be included in one of the 9 section. Well you don’t actually need to include all 9 sections- some can be combined. For example: “Language skills” and “Computer skills ” could be combined into one section and you could rename it “Language and Computer skills”. (see screenshot above). Work history should always be its own section. Whether you combine sections or not is up to you. A lot will depend on the design, the structure and format you decide to use. After your personal details, contact info and headline, you should organize each section by order of importance in terms of how they support your career objectives and your experience -with the most important and most supportive items towards the top. If you are a new graduate with little to no work experience than lead with your education. If you are a seasoned bilingual financial analyst applying for a similar job in France than lead with your work experience followed by your languages. Do you need to translate your resume to French? If you don’t speak much French, you’ll mostly likely find yourself restricted to searching for jobs posted in English. By all means apply to those jobs posted in English using an English version of your CV. Just make sure your CV conforms to French best practices (which I covered in this article). But even if you only plan on applying to jobs in France which are posted in English, be prepared to have your CV translated to French in case any of the companies you apply to ask for a French version of your CV. This might happen if the hiring manager wants to show your CV to other decision makers in the company who don’t speak English or prefer to read in French. If you speak or read passable French, you’ll open yourself up to many more job opportunities because you’ll be able to apply for jobs which are posted in French. In this case, you will definitely need to submit a translated version of your CV to job which are posted in French. 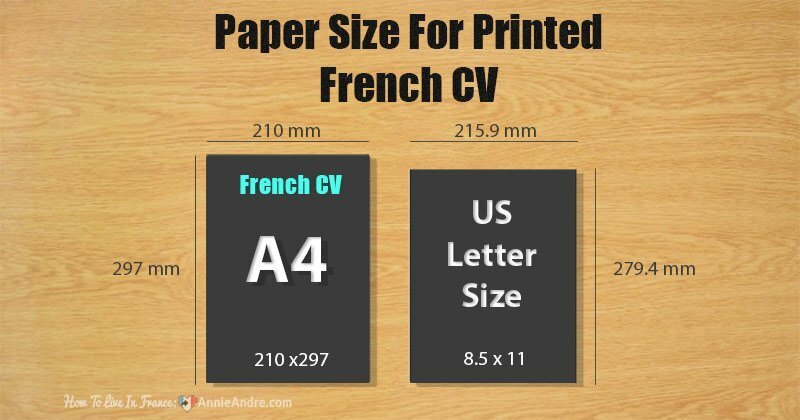 It’s essential that you create and save your CV so that it prints correctly onto A4 size paper which is the standard letter size in France and most of Europe. If you don’t, and you send them your CV saved as an 8.5 x 11 document, the words on your CV may run off the sides or print to the very edges. A4 paper is not as wide as US letter size. (see images below for a side by side comparison of the two). In France, both PDF and Word formats are accepted for submission of a CV but pay attention to the job post to see if they specify any preferences. I prefer to send PDF’s if the ad has no specifications because what you see is what you get whereas word docs have the potential to look different on different computers. Don’t forget to name your CV document something useful and clear so that recruiters will recognize it by its name on their hard drive. 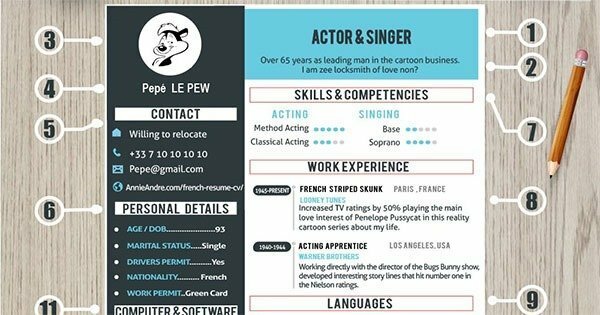 Check out this infographic: I like visual aids so I created this Infographic using Pépé Le Pew’s CV as an example. It summarizes some of the finer points in this article. bonne chance mes amis and happy job hunting. April Fool’s Day In France (POISSON D’AVRIL): What’s With The Fish? My husband Blake and I ditched our California lives and moved to France with our three kids back in 2011 and never left.